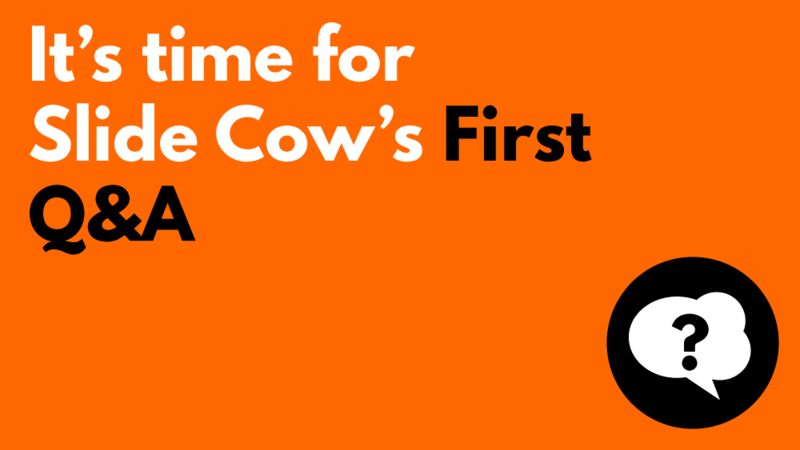 It's been a long time coming, but I think the time has finally come for me, the crazy and quirky founder of Slide Cow, to host its first Q&A session. Why Am I Running a Q&A Session? I think it's important for everybody who enjoys the Slide Cow platform to truly know the people running it. After all, my goal is to allow Slide Cow to become a personal brand. It's my job to make the effort and find better ways to connect with the people that make this community thrive. All I need you to do is submit a question that you want answered. Dropping a line in the comment section below to this post (this is the most preferred method). Replying to an email that I have already sent. Any way that's convenient for you. Your questions could be about anything. Literally. If you want a question answered on presentations or PowerPoint, such as what to do with your hands when you're on stage, or how to design a slide in a particular way, that's fine. If you want to get more personal, such as asking me what my favorite food is, or what my gym routine is like, that's fine too. Seriously, ask me anything you want. I consider all questions. Keep it to one question per submission. I mean I love you guys and all, but let's make sure everyone gets a chance! I'll compile all the questions you ask into one document and review them. Now, obviously, I can't answer all your questions. But I'll do my best to make sure that the questions people really want answered are. So on that note, I'll short list the questions that need answering, and dedicate my time to answering each one as best as possible. I'll answer your questions in a single post. The post might be blog-focused, but I think I'm leaning more towards a vlog-style Q&A, which means you might get to see me in action for the very first time. Sadly, I can't keep this sort of thing open ended. So, if you want a chance to have your questions answered, then submit them to me by the 26th of next week. Steps 2 and 3 will happen after that. Let's make this a fun process for all! I'm eagerly waiting for your questions, so get to it!